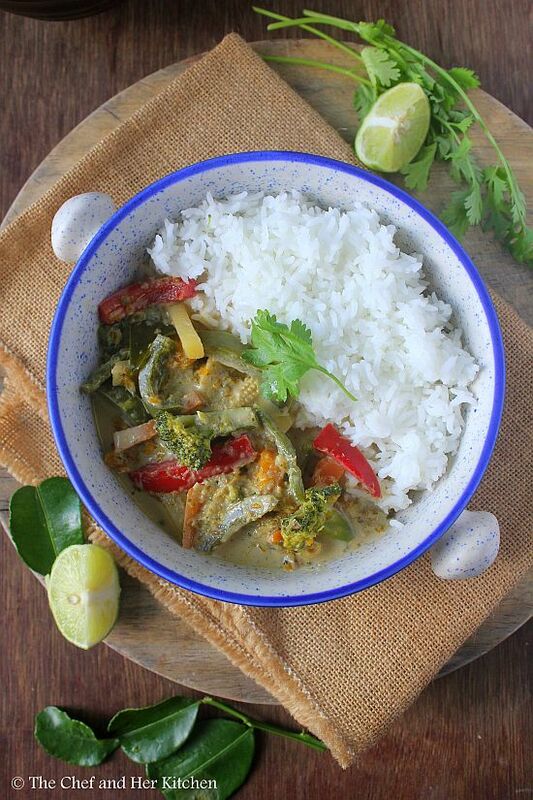 I am sure many of you guessed it that my next post would be Thai Green curry Recipe as my last post was Thai green curry paste. Thai cuisine uses a lot of shrimp paste and fish sauce in their recipes which turns me off to try Thai food at a new place.I prefer to prepare it at home rather than eating it out atleast the basic thai curries.Thai Green curry is definitely most popular apart from Thai Red Curry in Thai Cuisine and I absolutely love both the curries to the core. 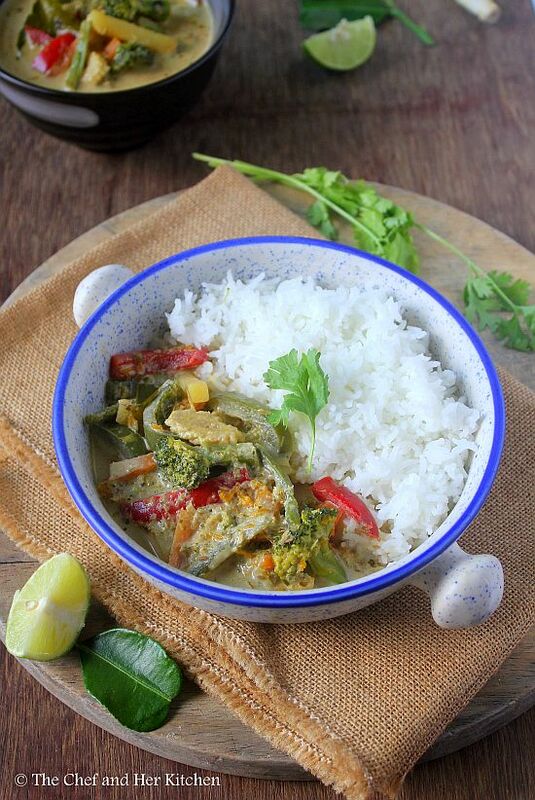 It is actually easy to make Thai Green Curry at home provided you have the Thai Curry packet in hand which is very essential. 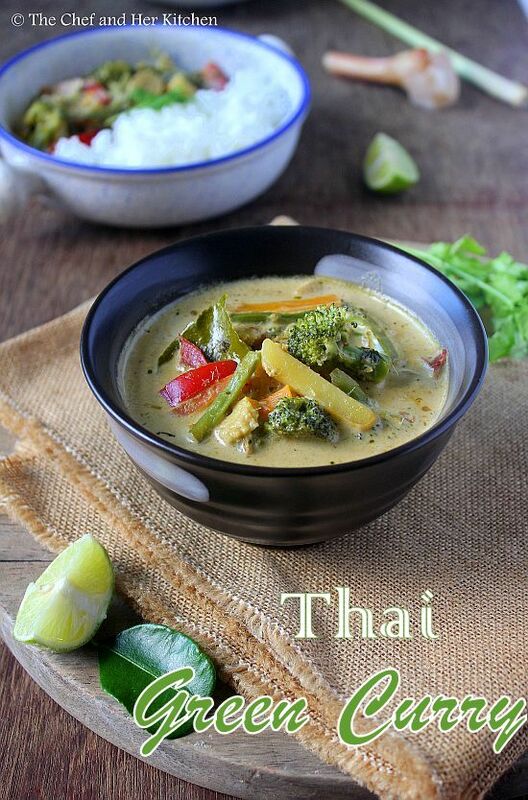 Thai food has a very unique and distinct taste because of the usage of lemon grass, galangal, kaffir lime and one can not substitute them with anything else to get that unique flavor. Though I have mentioned few alternatives to them in the notes section for those who want to try it still. Also the addition of coconut milk gives a nice subtle taste to the curry.Usually You can pair these Curries(Green/Red) with Tofu fried Rice or Jasmine Rice or simple steamed rice(regular/basmati). I have not blogged many Thai recipes in my blog so far but intend to post a couple of them very soon. If you are interested you can check my Spicy Thai Basil Fried Rice recipe. 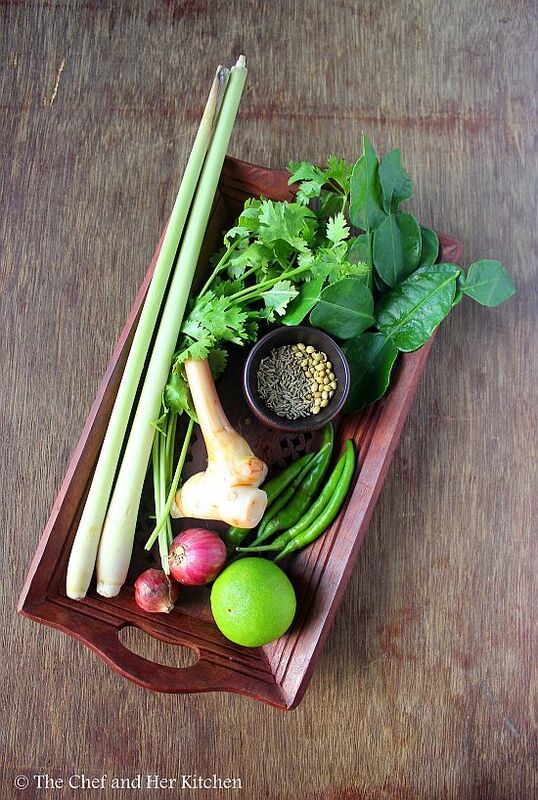 to prepare green curry paste:Grind coriander seeds, cumin seeds and pepper corns,cut lemon grass stalk, galangal, kaffir leaves, thai green chillies, shallots, garlic pods, coriander leaves, lemon zest and soya sauce to a coarse paste. Boil water in a bowl and add all the vegetables(apart from bell peppers) and cook them until they are 80% done.Strain the vegetables and reserve the water for the gravy. You can even boil the vegetables in thin coconut milk if you make it at home or dilute the canned one with water and used it for boiling. Heat oil in a kadai and add green curry paste and fry for a couple of minutes. Add sliced bell peppers and fry for 2-3 mins and then add chopped lemon grass stalks and drained vegetables and fry for a couple of mins. Add strained water and required amount of salt and let it come to a boil. Now add thick coconut milk and simmer it for 5 mins.Add thai basil and kaffir lime leaves and boil for 1-2 mins and switch off the flame. Serve it with hot Jasmine Rice / Plain White Rice / Plain Noodles/Coconut Rice/Spicy Thai Basil Fried Rice. The addition of vegetables is completely your choice. You can add cauliflower, tofu, mushrooms, zucchini etc according to your choice. But I recommend you to use broccoli, carrot, beans, potato as base vegetables and add the rest according to the availability. 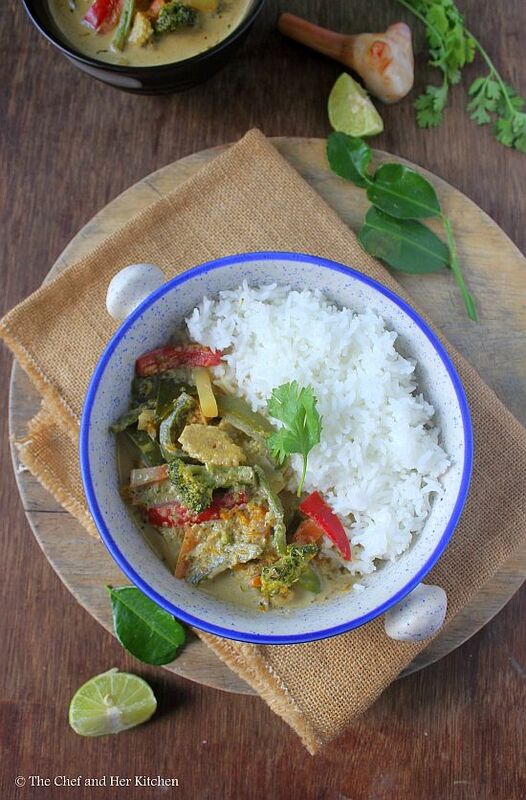 The usage of lemon grass, kaffir lime leaves, galangal ,thai chillies is mandatory for the recipe. But in case you do not find them you can use ginger in place of galangal, regular green chillies and lime zest in place of kaffir lime leaves and omit lemon grass. But the taste of the resultant paste is completely different in taste and aroma from the authentic one. You can adjust the curry according to your taste buds. It should be sweet,spicy and sour at the same time. Adjust the chillies, soya sauce and amount of coconut milk accordingly. 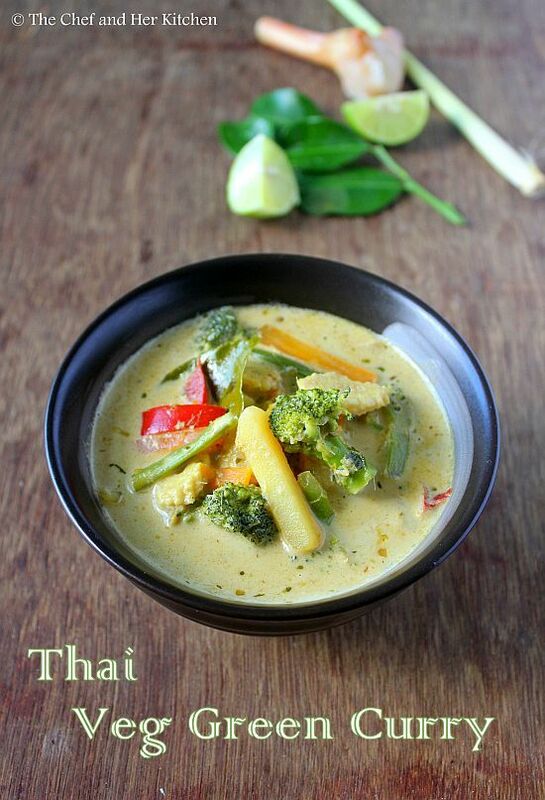 You can boil the vegetables in thin coconut milk instead of water or vegetable broth. If you are adding tofu I suggest you to add while the gravy is simmering rather than in the beginning otherwise tofu tends to break. You can even prepare fresh coconut milk at home and use it in the recipe.